If you search the Internet you will find numerous mobile marketing companies and agencies that offer mobile marketing services. There are even companies that work as mobile marketing consultants that advise on the best strategies and techniques to be utilized by their clients. Necessity Marketing is one of the best Miami Mobile Marketing companies based in South Florida. We develop client specific mobile marketing strategies and utilize a variety of techniques to reach our client’s goals including: SMS marketing, push notifications, MMS, mobile web marketing, app-based marketing, QR codes, in-game mobile marketing, Bluetooth, proximity services, location-based services, and user-controlled media. We develop quality original content for our clients. Moreover we optimize it to ensure it reaches every customer despite the device or operating system they may be using. The advancement of technologically sound devices has created opportunities for companies to reach customers through mobile marketing. 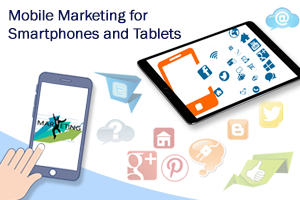 Mobile marketing is a more advanced form of marketing through mobile devices such as smartphone and tablets. Companies can reach customers with detailed, precise and updated information about a product or service on their device at any location or time. In other words, it can be defined as communicating and advertising products and services through the use of mobile devices over a wireless network. Now-a-days, companies are using mobile marketing solutions to get their products and services in front of current and prospective customers. This helps companies build brand value;develop a larger customer base and drive repeat sales. Mobile marketing is the easiest way to stay in touch with a large customer base at any given time. Prompt Results – A large percentage of the world’s population use mobile phones. Whenever a message is sent to a mobile device people are likely to respond to it or at least read the message. Even if the mobile device is in standby mode people can receive the message as soon as the device is turned on. Less Expensive– Designing and drafting content for mobile devices be it in any form i.e. text, image or video is very simple and cost-effective. Expedient to use – Compared to laptops and desktops, the screen size of mobile devices are small therefore the created content will be very basic and easy to understand. Personalized interaction – Mobile marketing utilizes direct and personalized interaction with customers. Easy to track response – User responses can be tracked easily and instantly. High viral benefits – Content can be shared easily with a large user base allowing it to go viral. Quick payment – Customers can make purchases quickly using secure online payment services. Advantage of Microblogging–Microblogging channels such as Twitter are widely used by mobile users. Easy to communicate with masses – It’s easy to communicate with large groups of people in a convenient manner. Companies can stay in front of their customers through devices such as smartphones and tablets with the help of mobile marketing. They can use different mobile marketing services to provide updated and authentic information about their products and services to their customers. These solutions or tools include text messages (SMS), multimedia messages (MMS), app-based marketing, push notifications, QR codes, Bluetooth technology, mobile web marketing, user-controlled media, location-based services, proximity systems and in-game mobile marketing. These solutions allow companies to send discount offers, special coupons, announcements and other promotional messages to their targeted customers. Contact us now for a no obligation consultation and analysis to see how our mobile marketing services and solutions can help grow your business.